Seven men have been arrested at locations across London following the Hatton Garden jewelry heist, which saw thousands of pounds of valuables stolen from safety deposit boxes in April. Police said the arrests followed raids on 12 addresses in London and Kent on Tuesday. 200 officers were involved in the raids, with seven British men aged between 48 and 75 arrested on suspicion of conspiracy to burgle. 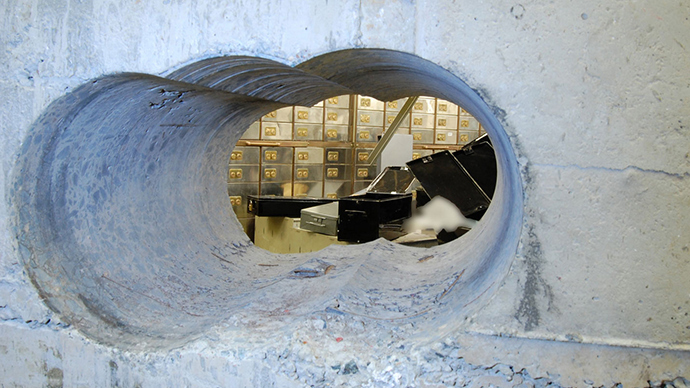 Officers said they are “confident” that at least some of the property recovered came from the Hatton Garden safety deposit boxes, which were broken into over Easter weekend. The thieves are believed to have drilled into a secure basement, and removed contents from 72 sealed boxes. The criminals also left behind a trail of debris used in the heist, including drills, crowbars and angle-grinders. The raids took place at approximately 10.30 on Tuesday morning. Scotland Yard apologized for not responding to the alarm that went off during Easter weekend, but added that the thieves wouldn't have been seen either way. “A number of large bags containing significant amounts of high-value property have been recovered from one address. Officers are confident these are items stolen during the burglary," a Metropolitan Police statement said. “All seven men have been taken to a London police station. Searches at the addresses are ongoing." “Over the last six weeks Scotland Yard’s Flying Squad has worked relentlessly, supported by officers from covert policing and major crime commands, to track down those responsible, and recover what was taken," the statement added.